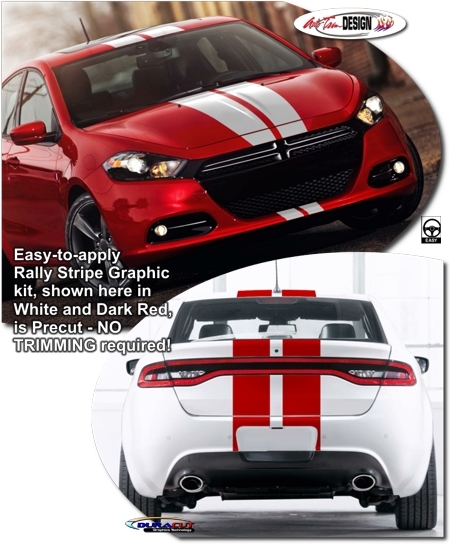 Set your '13-'16 Dodge Dart apart from the rest with our Rally Stripe graphic kit. Stripe package is not just a set of 8" (20.32cm) straight strips in a box. Kit consists of prefitted, tapered and contoured pieces as shown. Rally stripes are set for 2.5" (63.5mm) center spacing at time of installation. This kit is specifically made for '13-'16 Dodge Dart factory bumper, hood, roof and rear hatch/lid areas and will not fit any other vehicle. Trimmable Spoiler Kit #ATD-DDGEDARTGRPH018 consists of two (2) 16" (40.64cm) long pieces that can be trimmed during installation for custom spoiler applications. Base kit includes Bumper, Hood and Rear Hatch/Lid pieces only. Roof pieces are available as an optional kit.